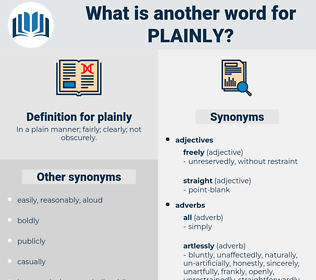 What is another word for plainly? In a plain manner; fairly; clearly; not obscurely. openly, obviously, frankly, unequivocally, evidently, patently, bluntly, explicitly, unambiguously, demonstrably, forthrightly, blatantly, honestly, expressly, definitely, absolutely, conspicuously, apparently, noticeably, amply, clear, Overtly, purely, certainly, perfectly, completely, sincerely, emphatically, categorically, significantly, markedly, visibly, vividly, directly, easily, downright, merely, unmistakably, naturally, objectively, totally, utterly, readily, squarely, appreciably, outright, truthfully, decidedly, transparently, roundly, quite, entirely, unreservedly, considerably, undoubtedly, substantially, indisputably, flagrantly, glaringly, abundantly, graphically, fully, unquestionably, recognizably, really, eminently, sharply, flatly, self-evidently, altogether, ostensibly, exactly, keenly, understandably, genuinely, firmly, publicly, straight, wholeheartedly, distinctively, basically, wholly, neatly, grossly, just, acutely, admittedly, truly. mendaciously, evasively, circuitously, ambiguously, insincerely, fallaciously, indirectly, falsely, tactfully, courteously, hypocritically, politely, deceitfully, untruthfully, wordily, civilly, diplomatically, long-windedly, equivocally, erroneously, verbosely. I could just see plainly enough to find my way to the door, and leave them together. Do tell me in words what you have already so plainly told me in your looks.